Tempe (pronounced TEM-pay) or written as Tempeh in western countries is an Indonesian word referring collectively to a variety of fermented foods (typically tender-cooked legumes) bound together by a dense mycelium of fragrant white Rhizopus mold into compact cakes (Ko and Hesseltine 1979). In Indonesia, traditionally and in dictionaries since at least 1875, the name for this food was written témpé , with various accents being used, especially to indicate the ay pronunciation of the final letter "e";. Soy tempeh was called témpé kedelé . In August 1972, when Indonesia modernized its language as part of an Indonesian-Malaysian effort to make the two similar languages even more similar, the accents were dropped and the word came to be spelled tempe (still pronounced TEM-pay). In English and other European languages, the word has come to be spelled "tempeh," the final "h" being added to prevent the word from being pronounced "temp." Most Westerners feel that the correct pronunciation is more important than the correct spelling (William Shurtleff and Akiko Aoyagi, History of Soybeans and Soyfoods: 1100 B.C. to the 1980s). I've known Tempe since my chilhood times and my relationship with tempe is like a never ending love story ;-). I will always longing for and keep searching it wherever I go, no matter it cost! When I was a small child, Tempe was considered as peasant food and mostly consumed by low to middle class of Indonesian society. I have seen Tempe being sold and bought everyday in a traditional market where my mother has had her small shop. No wonder, tempe is available anytime, cheap but tastes incredibly good. Today about 40 years later, famous nutritionist and food experts say tempeh is the food of the future. I feel mesmerized and proud, seing Tempe goes globally ;-). Accordance to a long history, related documents and lot of enormous researches, Tempe probably originated several centuries ago on the island of Java, in today's Indonesia. The earliest know reference there was in 1875. Much early research and publication was done by Dutch scientists, in Dutch. Tempeh was first produced commercially in Europe sometime between 1946 and 1959 and by 1984 there were 18 tempeh companies in Europe. The earliest known reference to tempeh in the United States was by Stahel in 1946. Extensive research work on tempeh began in the early 1960s at Cornell University (under Dr. Steinkraus) and at the USDA Northern Regional Research Center (under Dr. C.W. Hesseltine and Dr. H.L. Wang). America's first commercial tempeh was produced in 1961 by Indonesian immigrants, and the first commercial production by a Caucasian started in 1975 (William Shurtleff and Akiko Aoyagi, History of Soybeans and Soyfoods: 1100 B.C. to the 1980s). So, what can we make from tempeh? Actually nearly all dishes - from crunchy fritters, soups, salads even to sambal. 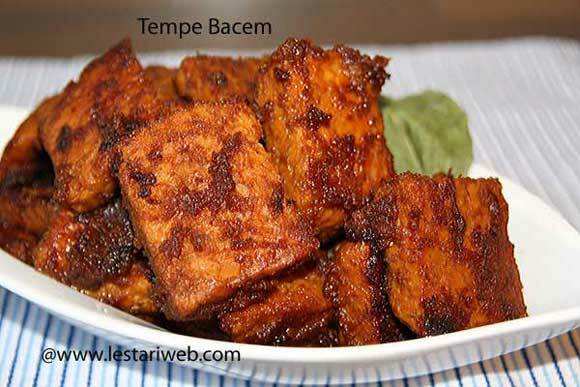 Tempeh is a source of vitamin B12, and can be used to replace meat. A perfect choice for Vegetarian and Vegan. But honest to say, Tempe is one of Indonesia's best delicacies in its simple authentic way but all became wrong in those over-done bastardized printed-book recipes!! In fact, Tempe can be cooked in many varieties way like we Indonesian do. Here are some Indonesian Tempe Recipes which you can try at home.